3G USB Modem for HSDPA high speed wireless internet at any time and any place - just insert your SIM card! This new version is compatible withAndroid 4.0 or 4.0.3 TABLET, Windows computers, laptops, notebooks, and netbooks. Total Compatibility: No matter where you are in the world, this 3G USB Modem allows for high speed wireless internet access 3G networks.which means wherever you have cellphone signal, you can access high speed internet! Easy Access: Simply insert your 3G compatible SIM card, plug in the 3G USB Modem, and you're ready to surf - easy as that. The convenient plug-and-play design detects the modem and begins installing the software from the USB stick automatically, allowing you to take your internet with you anywhere, on the road, in the office, worldwide. Plus, you can stick in a micro SD card to turn this USB 3G adapter into a USB drive and expand your storage by up to 32G! 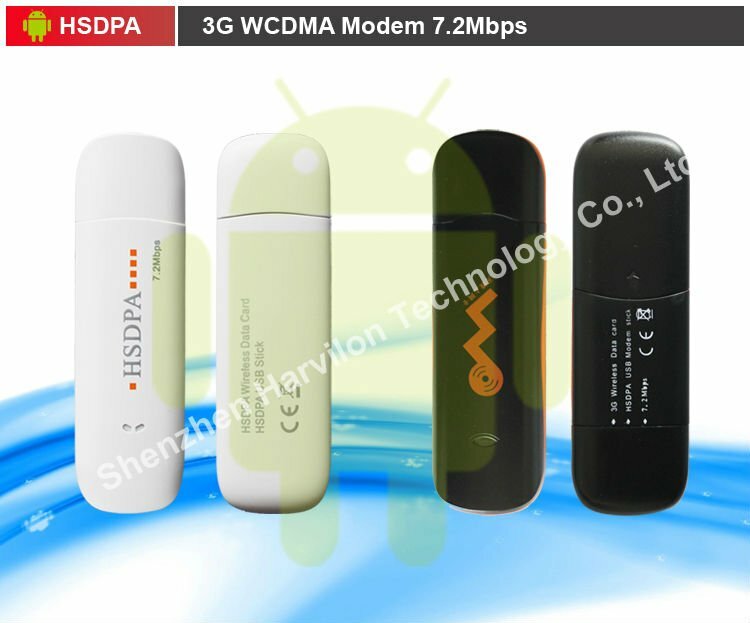 With this HSDPA USB Modem, the world is at your fingertips. If you own a laptop, netbook or notebook, then ensure yourself you will always be able to access the internet by ordering this 3G USB Modem today. This USB 3G Dongle is fully backed by our 12 month guarantee and is in stock now and ready for next day shipping. 4. Global connectivity - Use Anywhere! Please note: there are many colours available for this unit, send by random!!! 1)What does auto installation software mean? When you connect this HSDPA USB Modem to your Windows computer/laptop, the software will install directly from the modem without having to use a CD. This makes it more convenient to use the device on different notebooks and netbooks, ensuring you have maximum mobility without sacrificing functionality. 2)What kind of download speeds can I expect with this HSDPA wireless modem?